We are one of the reliable names engaged in providing the best Pure Ghee. Pure Ghee is enriched with goodness milk, which makes it a healthy option to be added in a variety of sweets and delicacies. Pure Ghee has no contaminants, adulterants and any sort of impurities. 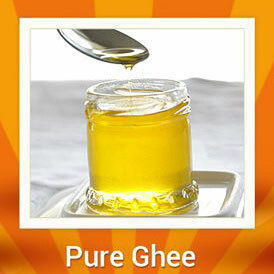 Just a tablespoon of our Pure Ghee is enough to make a dish tasty as well as healthy delight.